People in the PC industry keep telling me that desktop PCs are going the way of the dinosaurs – I reckon they are just getting smaller and smaller, ’till you don’t realise that you are using a full-fat PC which cost less than an iPad, because it’s small enough to be clinging to the back of your monitor. Case in point: this little Mele PC (PCG03) dropped in the other day – I was initially skeptical that you could get decent desktop performance from something the size of a paperback book, with Windows installed, for less than AUD $270, but was pleasantly surprised to find it met the requirements to use as a daily-driver PC – read on to find out why. 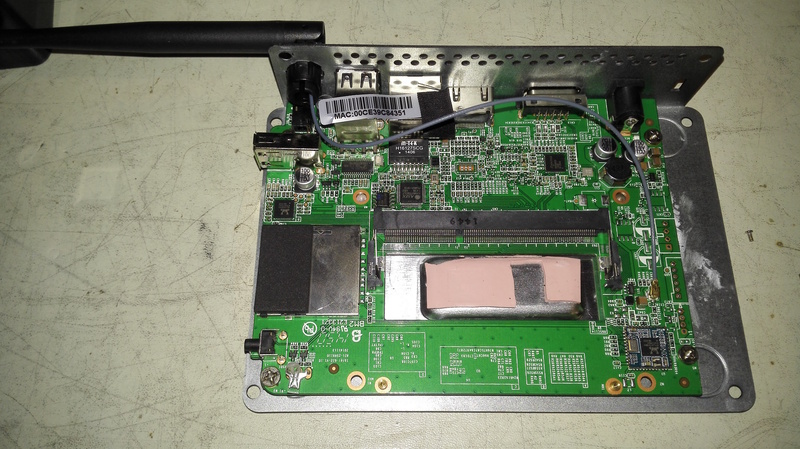 The PCG03‘s casing is reminiscent of a media player – not that surprising, as the factory is also known to produce the Noontec and Astone Linux-based media players. Plastic and unlabeled, bar the brand name, it’s very understated. There’s a blue LED on the front for power OK. 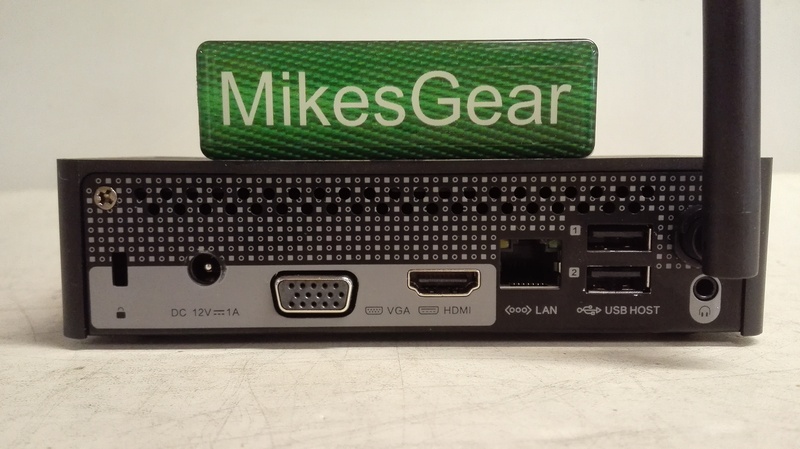 The back has a Kensington lock so you can prevent it from being thieved if you use it as a kiosk-PC, a 12v barrel plug power input, VGA, HDMI, 10/100 wired LAN RJ45 socket, 2x USB 2.0 ports, headphone 3.5mm socket, and a WiFi antenna that pivots through 180 degrees. It has a metal base that acts as a heat sink for the CPU module. There are 4 Philips screws on the bottom, and 2 on the back. All you get in the box is the PC, a 12v 1A 110-240v barrel-plug mains plugpack, and an instruction sheet that covers some basis Windows actions. You’ll need to provide a keyboard, mouse, and monitor. I’ve used it with a Bluetooth keyboard from Riitek, no issues pairing and range approached 10m with the onboard Bluetooth enabled. 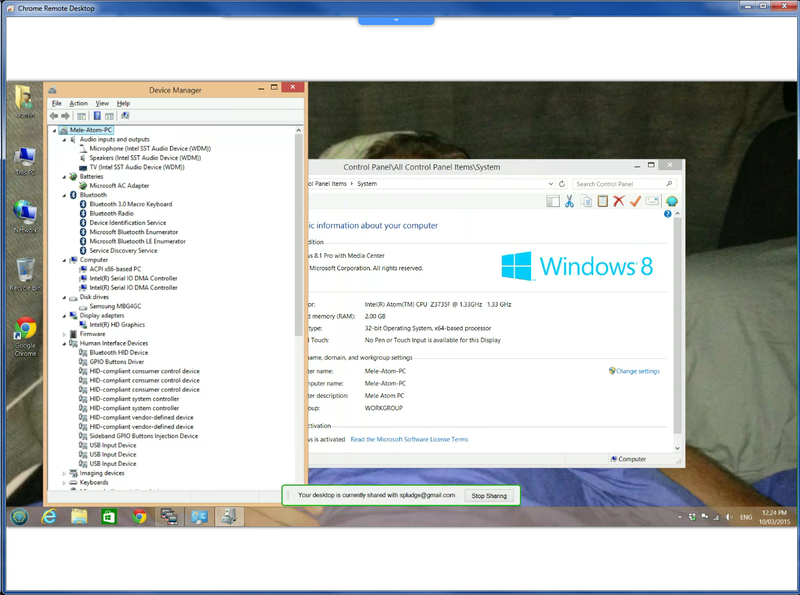 You could also remote-control it across the web with a tool such as Google Remote Desktop, as I did. 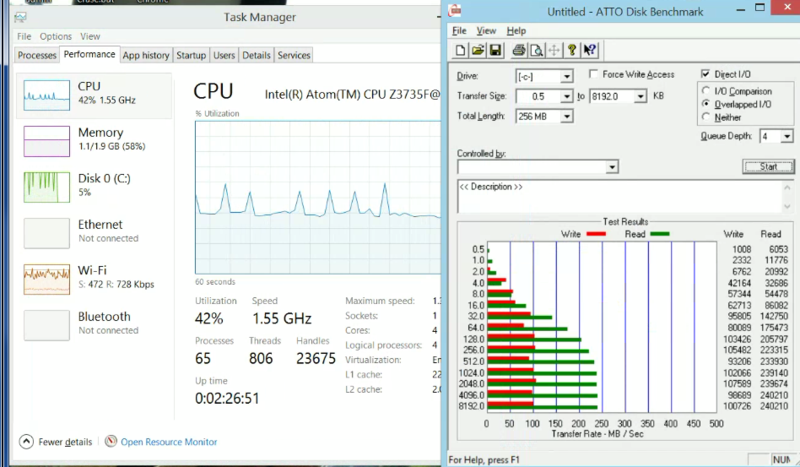 The PCG03′s Atom CPU spec says it runs at 1.33GHz, but I’ve seen it running at up to 1.83GHz under load. 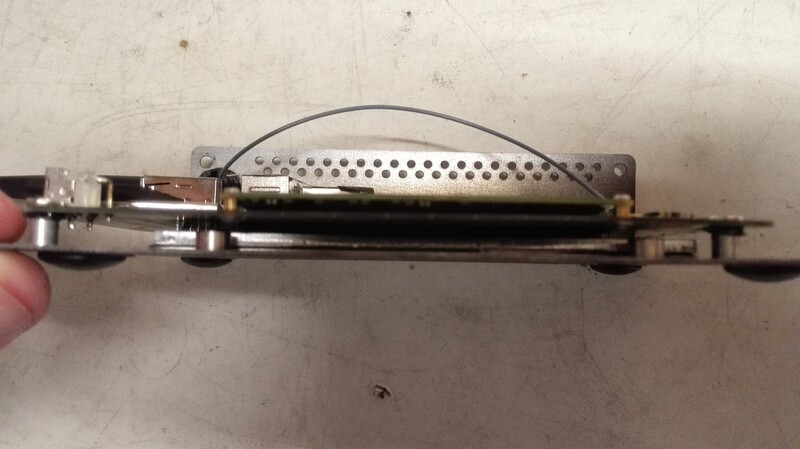 The CPU, RAM and eMMC are all on a removable card, suitable for use in tablets, that is held down by two tiny screws and some spring clips to keep it pressed to the base heat sink. On the left is the SD card-reader and power switch, with the LED just below. The majority of it is just empty space! 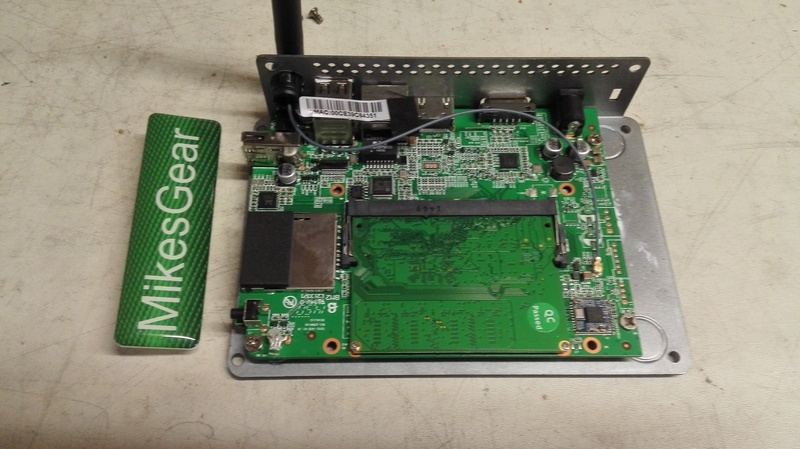 Here’s a view of the base-to-CPU sandwich with the WiFi antenna cable across the top. 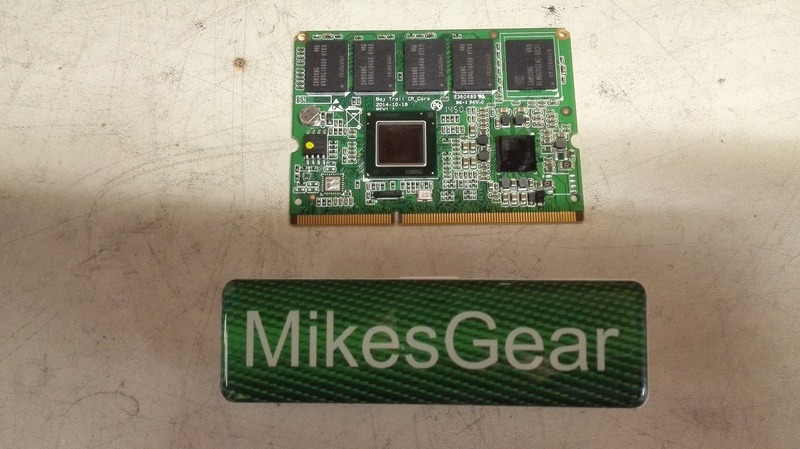 The built-in eMMC solid-state drive is handily fast enough to eclipse any regular desktop spinning-disk drive, although it’s about half the speed of a cutting-edge full-fat SATA3 SSD. Atto reports speeds of 100mb/Sec write, 240mb/sec Read, this with about about 20Gb of the 32Gb total used by Windows and filesystem. You can see the removed 4-core CPU card, with Samsung RAM and Samsung eMMC chips, below. Interestingly, the spec mentions USB2.0 for the USB ports, but Device Manager reports “Intel(r) USB 3.0 Extensible Host Controller” – I’ve tested the ports with a USB3.0 thumb drive, and they managed 35mb/sec. The CPU module has a small bit of thermal interface material to cushion the ancillary controller chips. Give the price of the PCG03 is $270 delivered, and that you can locally buy a full OEM copy of Windows8.1 for not much more than $120, I’d guess that Microsoft is trying to get into the low-powered PC space by selling the O/S for use on these kinds of PCs for around a quarter-to-half of the OEM-desktop price. Given the otherwise-slow adoption of Android outside the Phone/Tablet space, this “Microsoft Tax” reduction is probably going to work out well for them, as people are fairly familiar with the Windows desktop metaphor, and it can be easily customised to be a platform for media player software and home-automation. 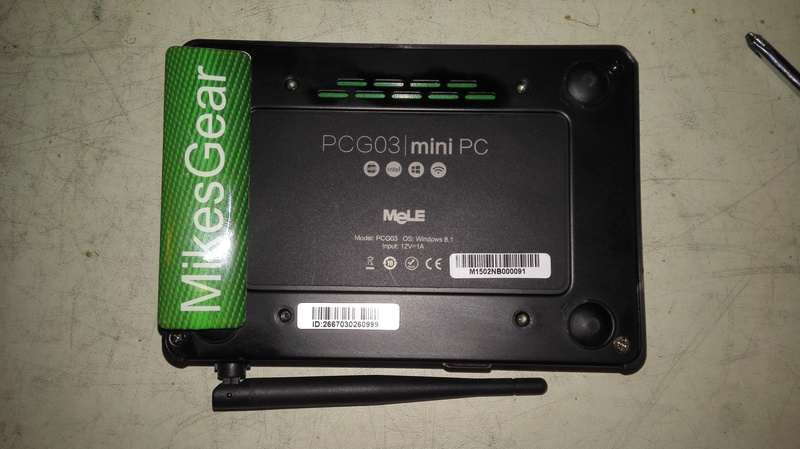 The PCG03 comes out of the box running genuine activated Windows 8.1 with Bing 32-bit version – there’s no CD-Key sticker, as the key is buried in the firmware somewhere – the Magical Jellybean Keyfinder will happily extract it for you, in case you want to reload Windows from a USB drive. It’s “Bing-ness” doesn’t prevent you from making any other search engine as a default choice, and you can install any other browser of your choice – like many people, I often only use Internet Explorer just once on a brand-new PC, to download another browser such as as Google Chrome, along with all my other favourite apps in one go via Ninite. 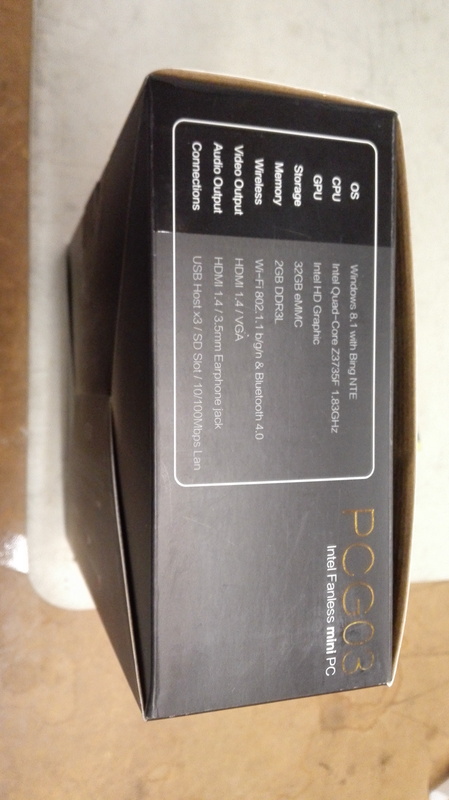 Out of the box, the PCG03‘s Windows8.1 experience is pretty good – turn it on, it’s ready to login and get working. There’s no bundled crapware or third party apps – just the vanilla O/S. Once you kill the Metro touchscreen tiles and “charms” bar with ClassicShell, you’ve got a Windows7-like desktop and familiar usability, without any of Microsoft’s please-please-use-our-app-store-to-get-more-apps begging. Windows Update had not been run on this image, so I grabbed all available updates without any issue – this took a couple of hours over WiFi/ADSL to do, and used up another 3Gb of the 15Gb space remaining – you can purge the already-applied update cache if you run out of room. One setup quirk – the HDMI display is really only usable on a native 1080p 1920×1080 display – if you’ve got an ancient TV with 1366×768 1080i resolution, you’ll find it’ll enlarge the desktop image (overscan) beyond the actual screen border, and there’s no way to correct this at the display-driver level due to the training-wheels graphics settings app that Intel provides. Forum discussions suggest this seems to be an Atom/Intel driver issue that affects all brands of gear using the embedded Intel HD Graphics chipset, so if you are in this situation, check if your TV can compensate for it by zooming the display, otherwise consider buying a new TV – it probably won’t cost much more than the PC did. I was curious if the “Bing” versions of Windows8.1 are upgradeable to 8.1Professional (Pro gives you Bitlocker, Remote Desktop host, and the ability to join Domains). The Pro pack also has the Windows Media Centre add-on (WMC, or better known as MCE to us old farts) – the PCG03 has a link to upgrade Windows online, but following it results in a prompt stating “It’s not possible to upgrade online in your region”, and it tells you to get a physical key instead – it didn’t seem to matter what region I set in the Control Panel. Undaunted, I grabbed a physical key upgrade (5VR-00140 $134 delivered), and this product key, once entered, upgraded the base 8.1 O/S to 8.1 Pro in a few minutes. 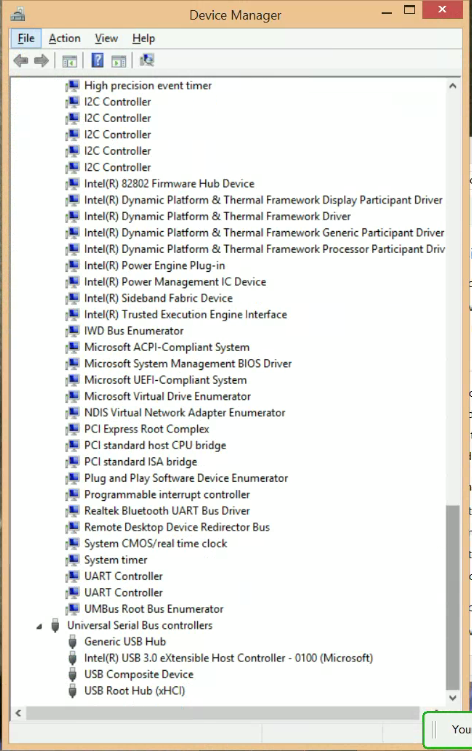 Here’s the list of the PCG03’s Device Manager components – it looks like the Atom core has many more interfaces than the PC actually has ports for. 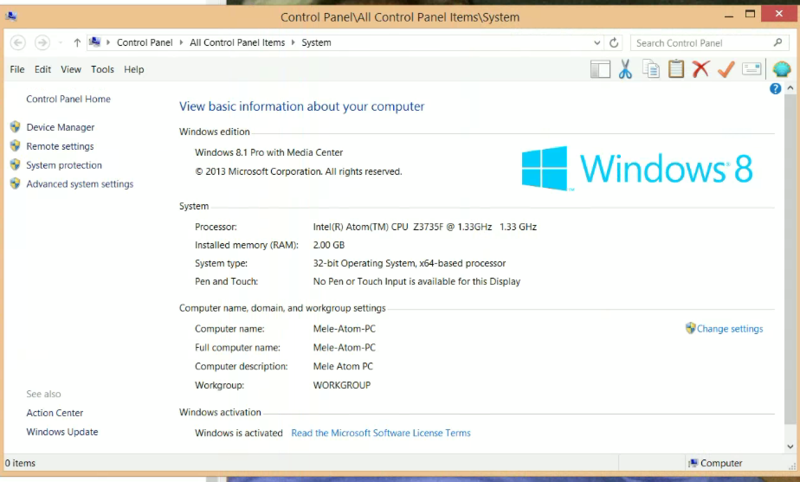 You can update the Windows 8.1 install to Windows 10 on this unit during the free upgrade period, but as of 25th August 2015, there’s no official Win10 driver for the included Wifi chipset. You can use the Win8.1 driver though, as it’s the same – there’s a walkthrough on upgrading, and links to the driver, at ChinaGadgetReviews. Can it replace a traditional PC? The PCG03’s capabilities as a desktop replacement feel to be the equal of, or indeed better than, many basic PCs built over 4 years ago with a spinning-disk drive. Those PCs are usually spending more than 90% of their CPU time idle as they wait for the hard drive to catch up. Given that the PCG03‘s SSD has so much better read/write speeds and lower latency than the average desktop spinning-disk drive, it hides the fact very well that the Atom CPU is weedy by comparison to a desktop CPU. I’ve opened 17,000-row Excel spreadsheets on it in 30 seconds or so, the same sheet takes around 15 seconds on the Core i5 desktop I’m writing this on. 2GB of RAM was not a limiting factor when running WMC or XBMC, From unboxing it to starting work with all my favourite apps installed would be less than half an hour. Does your office have a bunch of people using Remote Desktop? 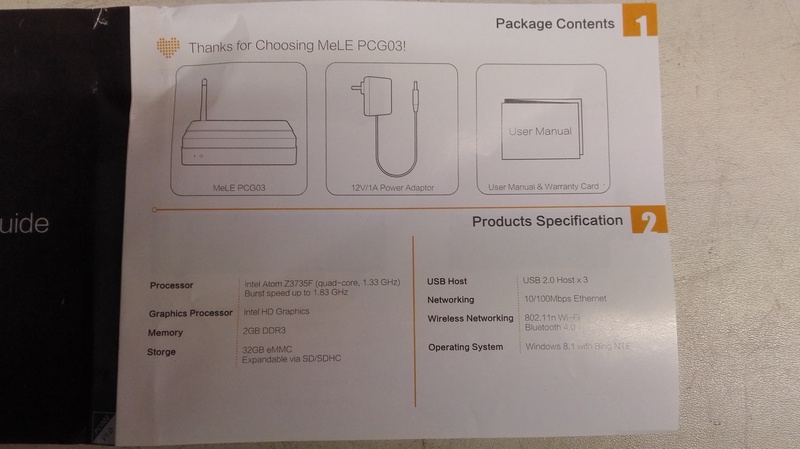 If so, the PCG03 will be indistinguishable from any other basic desktop PC with regard to it’s capabilities as a RDP client, except for being a heap cheaper and smaller, and it’s still a got decent performance, and a familiar desktop O/S once they need to do things locally, unlike dedicated thin clients that often cost a fair bit more. Plus, you can lock it down with the Kensington lock, if the PCs are in a publically-accessible location. Do you need two monitors to work productively? No problem, it’ll do that, as long as one is HDMI and one is VGA. The dual-display feature is baked into Windows and can be turned-on with a few clicks from the desktop “Adjust resolution” menu option. Want to play 3D FPS games or MS FlightSim? You’re out of luck, as the on-board video is too low-powered to deal with their 3D demands, unless you like your framerate to be like a stop-motion animation cell – buy something with a nVidia card if that’s your requirement – it’ll play Farmville or CandyCrush just fine though, if you need to give a PC to the kids to work on. There are lots of uses for a PC this tiny, cheap and low-powered – In-car computer or caravan media player (no moving parts to bump, and it’s already 12v-powered by default), digital signage display controller, with source material on easily-swappable SD memory cards, web pages, or updateable over the network, scanning station for pickers and packers with a USB scanner, a bargain-basement cash-register or restaurant system, a budget web-server for intranet use, and so on. 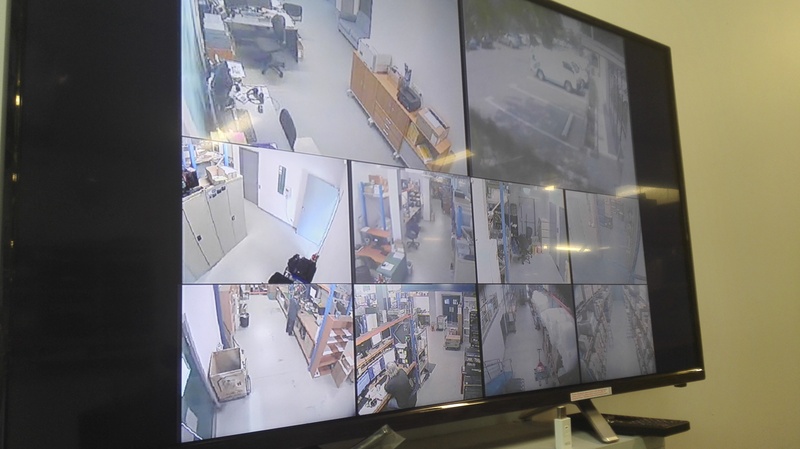 At the time of writing, I’d hidden one behind a 40inch TV in our office, and was using it to display the output of our 16-camera surveillance system via WiFi. But, if the boss wants to watch the Melbourne Cup, or listen to HK radio when he’s working here on the weekend, he just needs to grab the remote and launch Kodi to do this. It’s ultra-low-power-ness lends it to being an excellent way of making dumb TVs smarter. 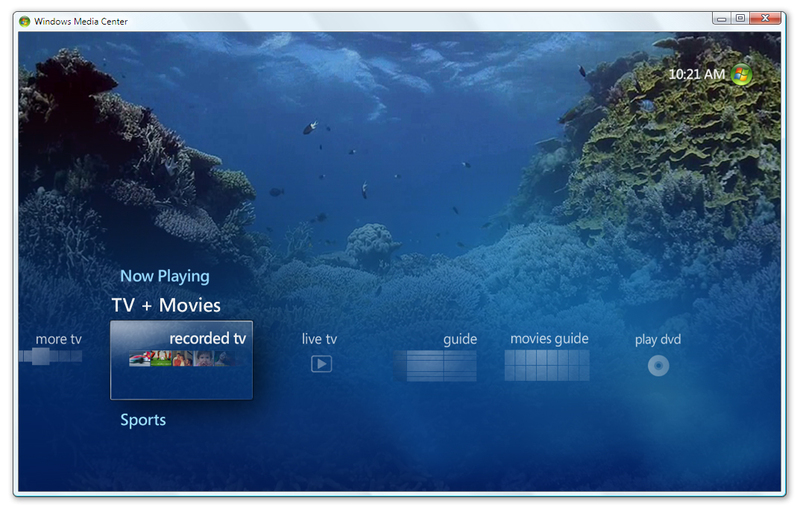 The obvious ways to do this are Windows Media Centre (Costs $134 as part of the Pro Pack) or XBMC (AKA Kodi – free). I’ve used WMC for years, and it’s capable of doing most TV-related tasks pretty much without any detailed setup to speak of – if you’ve got an IR remote and a USB tuner connected, you can set it all up with just the remote, and it’ll make watching TV with pausing and recording a breeze, plus there’s lots of community forums for hacking/customisation. Want to watch streaming on-demand TV via Netflix, Stan, Hulu, Foxtel Play, or Presto with just one low-powered, always-on device? Just install their apps or load their webpages on this PC, and you are good to go, as all of these services are available on the Windows platform (You’ll need to geo-dodge Netflix if you want the full-fat US-only content that’s denied to us Aussies – the same geo-dodge also works fine for Hulu). I installed an Avermedia A835 DVB tuner, and Zotac IR remote, and the PCG03 was able to play local free-to-air TV without any issues. 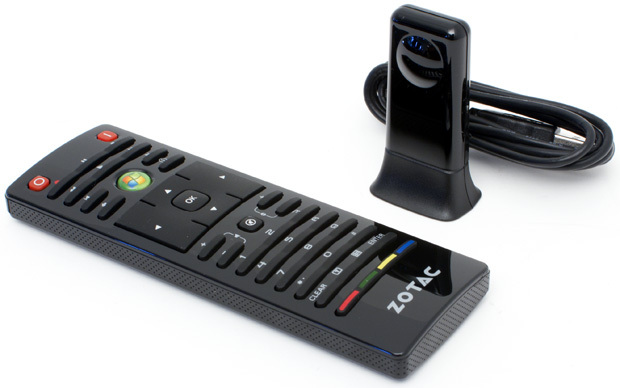 The TV tuner came with drivers on CD – the remote required none (the TV tuner’s bundled remote does not have the MCE-centric buttons, which the Zotac does). CPU usage was below 20% during playback. Kodi, on the other hand, requires more setup work to get it going, but rewards you with a lot more customisation options, and you can’t beat the price. To watch TV, you need to install a TV server app that Kodi can talk to, and to stream media, you need to install plugins to suit. 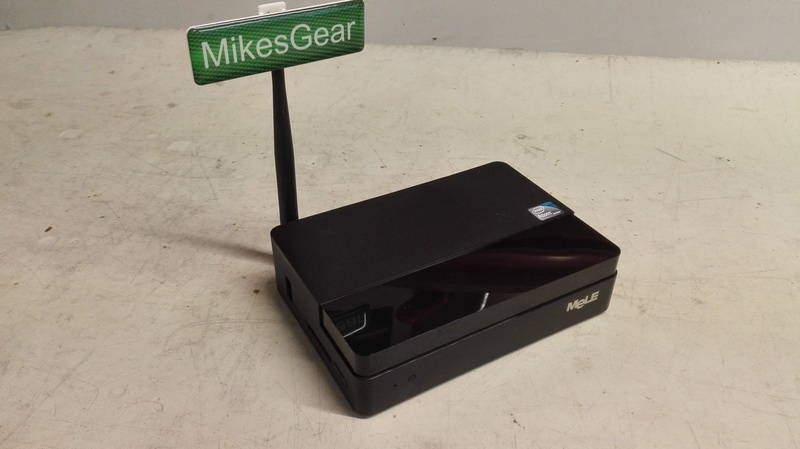 It was capable of recording and playing live TV from the USB tuner easily enough, and Kodi can also playback IP streams, such as overseas IP TV and IP radio stations (HongKong radio was a hit with the boss here), and it can deal with network-stored content from your NAS – a more detailed review of its capabilities is available on Youtube. 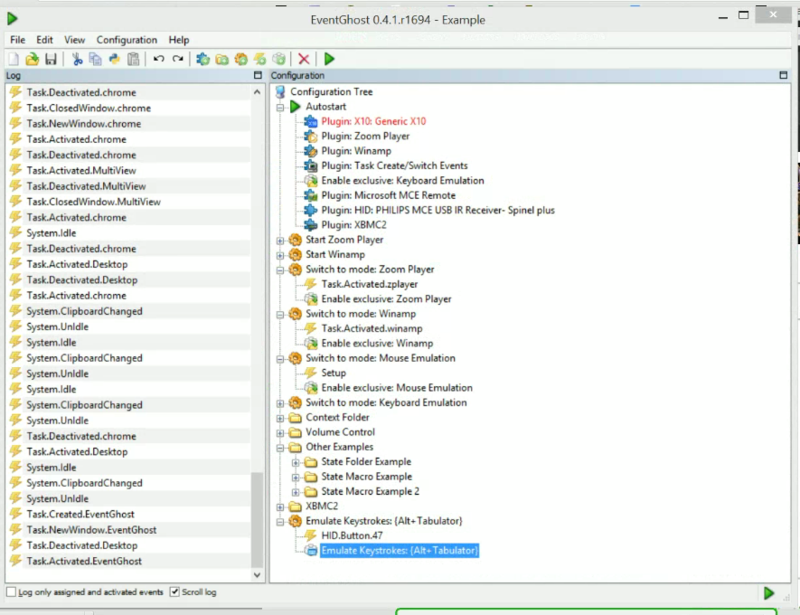 The Zotac remote has much of its functionality enabled out of the box, but if you want to enable the big green button as a “home” button, or link specific buttons to tasks, such as Watch-Live-TV, you need to install third-party utilities such as EventGhost to enable this. EventGhost resides in the tray, and can be configured to intercept IR commands, and redirect them to emulate specific keyboard inputs. I’ve configured it to emulate the MCE remote config using Philips MCE receiver Spinel Plus, so that the Green Button returns you to the Kodi main screen, and the green Teletext button launches Kodi itself – you can keep going until you make all the buttons do whatever you like, unlike WMC, where they are pre-rolled. I’ve come across someone who has installed Debian to a PCG03 – no reason why you couldn’t do this as well. I’ve tried it with Ubuntu Live CD ported to a USB thumb drive drive, and it worked, except for not detecting the Wifi. You need not worry about hibernation to save power, as the PCG03‘s theoretical-maximum power-usage of 12w works out to less than 300watts total consumption per 24-hours, which would be less than $0.10 per day, or less than $35 per year (based on max $0.30 / KWhr paid in Australia). The CPU has a real-world usage closer to 5w though, so actual consumption would be less than this estimate. 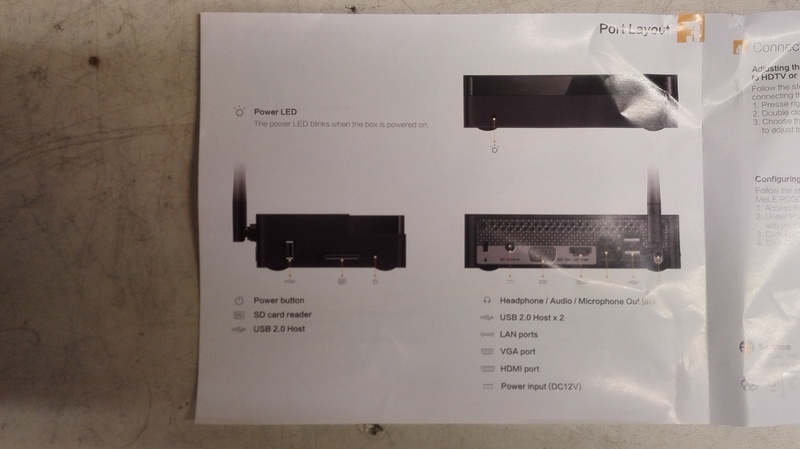 My regular desktop here uses a little over 120w for 8+ hours a day – add on a few hundred more watts for the hibernating usage overnight, and it’ll probably amount to 400KWhr, or more than $120-worth of power per year – in a worst-case scenario, the PCG03 will amortize it’s purchase price in power-savings alone in less than 3 years, if you use one to replace an old desktop PC. 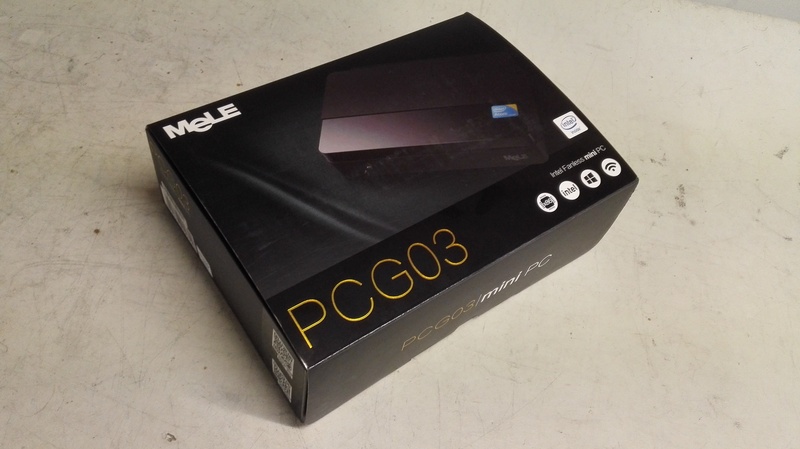 The PCG03 is being sold on Amazon for USD $199 – that works out to around AUD $270, plus freight, which is a bit higher than the local delivered price here in Australia at the time of writing – the local distributors will be bundling them with HDMI cables or Powercubes, depending on what’s available. I’ve also seen it for USD $149 / AUD $200 without Windows overseas only, but given the cost of buying OEM Win8.1 in our market is over $120, it’s not worth buying “naked” unless you plan on only using Linux. 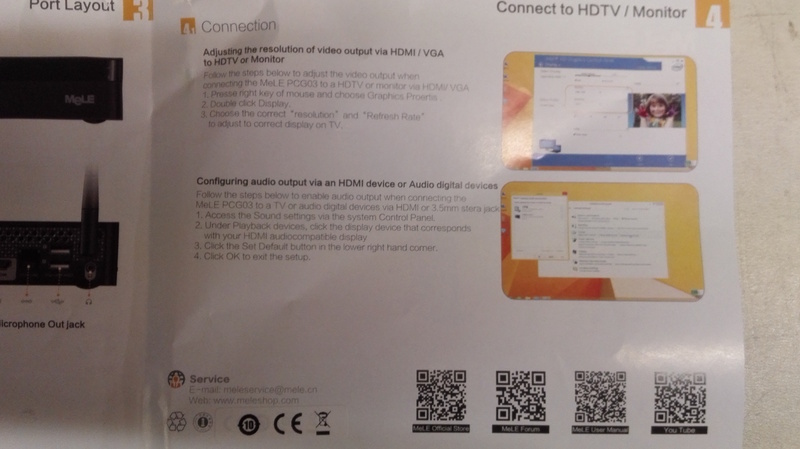 The default alternative to this is the Intel Compute Stick with Win8.1 , around AUD $240 plus delivery in Australia – the Stick only has 1 display, 1 USB port vs 3, no VGA, no wired LAN and no Kensington lock, so, if you want a play-it-all media player, cheap remote desktop client, or a basic desktop, you wouldn’t go past this little guy. 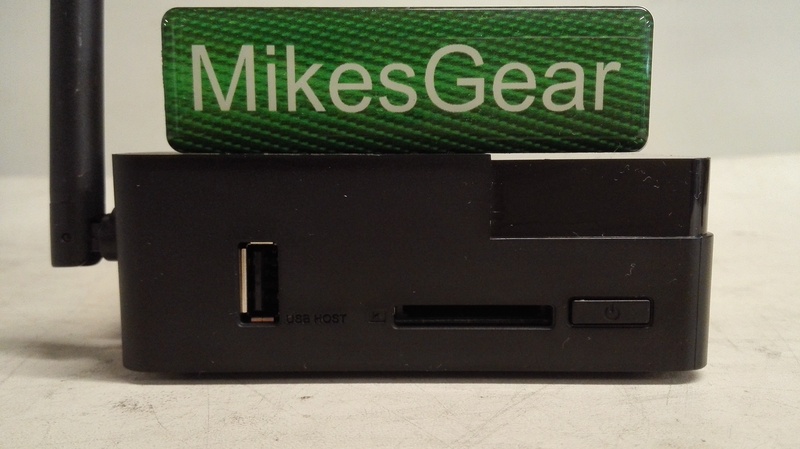 This entry was posted on May 14, 2015, 12:45 pm and is filed under Mini PCs. You can follow any responses to this entry through RSS 2.0. You can leave a response, or trackback from your own site.